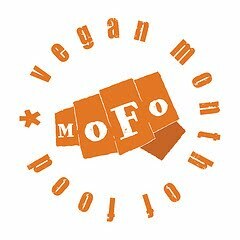 Welcome to Day 22 in the Great Gravy Experiment of Vegan MoFo Blogging, 2010. Still going strong, plenty more recipes to share. But let me digress for a moment. I find statistics fascinating. Resources like Google Analytecs, and Sitemeter end up being pretty absorbing reading for me, in a geeky, 'Numb3rs' sort-of way. I love following the traffic on my blog; where people are from, what search brought them here and what recipes are most popular. My "Chick'n and Dumplings" had been the reigning recipe for quite a while, but in the last two weeks the most searched vegan recipe (no, not gravy) has been "Vegan Pecan Pie". No surprise, being that Thanksgiving is right around the corner. So for those of you still searching, this has nothing to do with gravy, but in a shameless self-promoting way, here's the link to my Vegan Pecan Pie recipe. And it's foolproof!! I've made this dozens of times since posting and it's always a HUGE HIT!!! Seriously? I'm not gaining anything by sharing the link, I just want everyone to have good pie for T-Day. This gravy recipe ALSO contains pecans, (which happen to be my favorite nut - aside from a few people I know). I may be a bit spoiled though, as I have a great (free!) source for these often expensive little gems - my friend Shaun (check out his great little newbie blog) lives in New Mexico, and he brings me big bags of them from his Granny's pecan trees. Pecan orchards in New Mexico. Who knew? Anyway, this gravy is a bit different from the savory "meaty" gravies that I've been blogging. I personally think it's absolutely wonderful for a special Thanksgiving or other Holiday main dish though. Not to worry, the alcohol cooks out. I've used it with baked acorn squash; roasted root veggies; over wild rice pilaf; seitan "turkey", vegetable-nut 'loaf'; and, my absolute favorite - the super-amazing "Cranberry Hazelnut En Croute" that the fabulous people at Field Roast gave me last Thanksgiving. Try this when you're feeling all fancy (even though it's very simple)! 1. 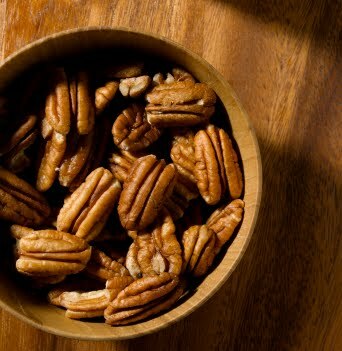 Toast pecans in a dry skillet until fragrant and starting to brown. Watch them carefully, once they start browning it happens FAST! Set aside. 2. Bring next 5 ingredients to a boil, stirring occasionally, until sugar dissolves. Lower heat and simmer on medium for 10 minutes until reduced a bit. Remove from heat. Discard bay leaf and rosemary. 3. Melt margarine in a large saucepan over medium heat. Stir in apple and onion; sauté 6 - 8 minutes or until onion is tender and apple begins to caramelize. Add pecans. Whisk in flour, and put back on heat. Cook, whisking constantly, 1 to 2 minutes or until flour is smoothly distributed and mixed into juices and margarine. 5. Gradually stir broth into apple-pecan mixture. Then add water, herbs, seasonings and apple juice mixture to pan. 6. Bring to a boil. Reduce heat, and simmer, stirring occasionally, 5 minutes or until thickened. Season with salt and pepper.